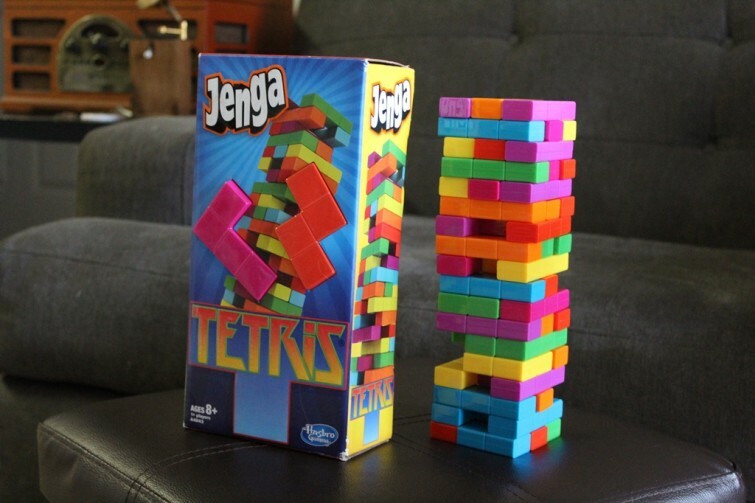 As a concept, Tetris-edition Jenga sounds like an awesome idea. It mixes two classic block-stacking games and adds some charm with brightly colored blocks. But the results are rather disappointing. On a scale from one to ten, I would give this edition of Jenga a six. There a couple of components of the game that are fun from a novelty perspective. But when it comes to playing the game, the design, material and shapes makes this special edition Jenga set difficult to play– especially compared to its wooden classic version. Firstly, it’s made of cheap plastic. This makes the game more difficult to set up. It’s almost impossible to make the tower stand tall and straight. With the wooden pieces of the original, it was relatively easy to slide pieces out without pulling other pieces with it, as they sometimes lock together. Secondly, the pieces are shaped strangely. Some of them are Tetris pieces, which are made up of four square blocks (called Tetriminos). However, to make the game stack-able, some of them are not Tetris pieces. On most of the levels, there is some empty space, which makes it difficult to know how to set it up. Each level feels random. It also makes it more difficult to anticipate what will happen when you pull out a piece. I found that games typically take about half the time than a typical game of classic Jenga, and the outcome is sometimes based on luck. That being said, this edition of Jenga would be great for Jenga fans who are looking for a new challenge or for collectors who want to pick this up for its novelty value. The box looks fantastic, and the colors really pop. You can purchase a copy of Tetris-edition Jenga right here. If you’re looking for a great video game-inspired Jenga game, you might also want to consider the Donkey Kong edition, which is more like the classic version.